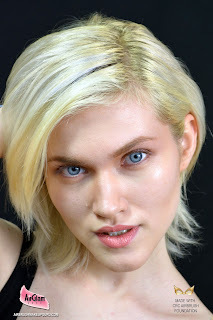 Camera Ready Cosmetics is in our honest and unsponsored opinion one of the best pro makeup stores in the world. Originally founded in California by makeup artist Mary Erickson, the operation recently moved its base to Dallas, Texas, where it has expanded its product catalogue significantly and from where its success has continued to grow. Crc's secret is a very simple, time tested yet too often forgotten formula: they offer only the best brands at the best prices with the very best customer service imaginable. On top of that CRC offers very convenient worldwide shipping for most of its products, which is a vital feature often missing from other online distributors. 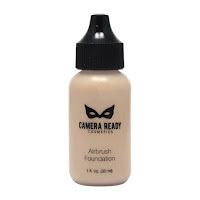 Camera Ready isn't just a distributor of other brands, however, but has developed a very interesting line of products that it distributes under its own name. The philosophy behind CRC's own line is very simple, and reflects the generous, no bull attitude of its very founder: to provide new and established professionals with tools and products that perform effectively while remaining free of the costly burden of mainstream marketing. CRC Airbrush Foundation is one of the most prominent products resulting from this commercial strategy. Many perspective buyers may be hesitant to try out a product that has not been as widely advertised as an equivalent from better known brands, so we decided to put it to the test hoping that what we found out may help you decide whether to try this or not. The line consists of ten water based shades of foundation presented in a generous, no frills 1 fl. oz (30ml) size and sold at a very convenient price. Most importantly, big sample sizes of 1/4 oz (7.5 ml) can be purchased for each color for just 3.99 dollars. 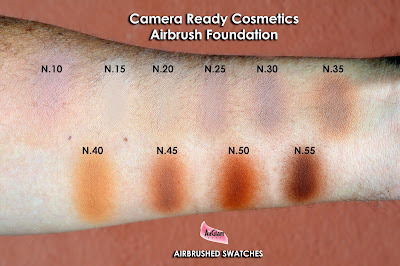 While the range is not very extensive, the shades included in it have a very neutral slant which will allow them to match most complexions from any ethnicity, and of course as with any airbrush formula the colors can be mixed together to refine the tonality to perfection. The enclosed photo of the airbrushed swatches, shot in natural sunlight, will give you a better idea of the undertone for each shade. Foundation N.10 is the fairest beige hue, while N.15 will match the lightest yellow undertone. The colors that follow are more neutral with a slight leaning towards either group. 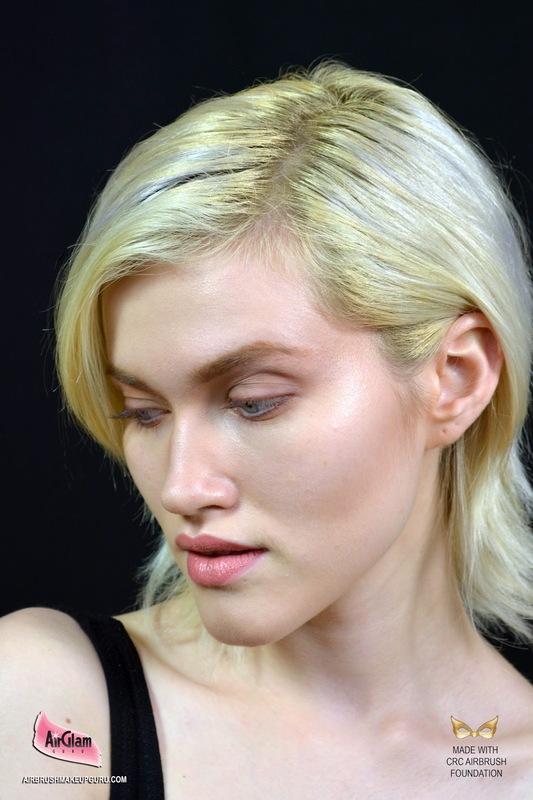 The foundation's formula has a medium viscosity which allows the colors to be used with practically any airbrush. For our tests and our video tutorial we used Kett's .40 airbrush, which has a slightly wider nozzle, but in other tests with any 3.5 nozzle we did not experience any clogging whatsoever, and cleaning the airbrush was a breeze with our Nurturing Force universal cleaner. The products provides very good coverage and good resistance to transfer and water. Tears will not cause the base to streak, and the finish will not be altered if allowed to simply air dry after exposure to moisture. Finally, the foundations have a very light, pleasant scent that is barely perceptible and will not linger after application. We decided to put the products to the test in a video tutorial where we used 5 shades of CRC Airbrush Foundations to accomplish a whole look. 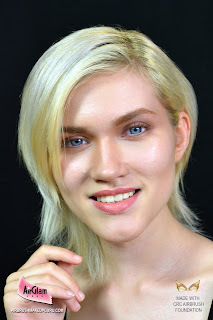 The goal of the video was to show how natural and versatile these products could be, and we believe the result and the unretouched photos we included here speak for themselves (pls click on each photo for full screen mode). Whether you are a consummate makeup artist, a beginner or a personal user, CRC Foundations and their samples represent a fantastic opportunity to own a whole airbrush makeup foundation range at the most reasonable price imaginable. CI 77891 (Titanium Dioxide), CI 77491 CI 77491 CI 77492 CI 77499 (Iron Oxides), CI 77007 (Ultramarines), CI 77288 (Chromium Oxide Greens).